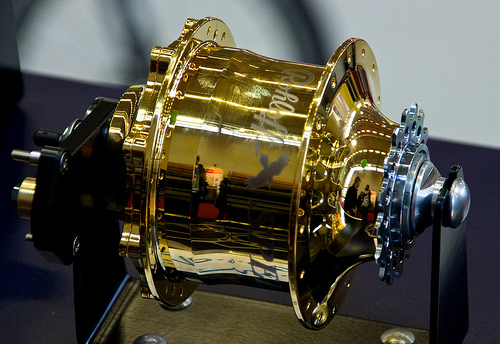 The Rohloff Speedhub is the most sophisticated gearing system ever made for bicycles. 14 equally-spaced gears are operated by one twistgrip – no overlapping ratios, and the gear range is as wide as a 27-speed derailleur system. The Speedhub is much more efficient than other hub gears – lots of high-precision bearings run in an oil bath for very long life and low drag. The Rohloff should never need maintenance. The Speedhub comes in several versions, for disc or non-disc wheels. Discs are available for all major disc brake manufacturers. Want to see how the gears work out? Try our gear calculation software here – remember that the Rohloff has a 16t cog as standard (13, 15 & 17 are optional). Unless you have long horizontal dropouts or an eccentric bottom bracket, the Rohloff chain tensioner takes care of chain slack. The gear shifter is machined out of aluminium – unusually, the indexing is built into the hub, so even if the cables stretch, it will never go out of alignment. The shifter uses two pull cables, there’s no spring, so even if the cables get totally gummed up, the hub will still shift – you’re not relying on spring tension the way you are with all other shifting systems.